Buon Giorno, Milan, Italy! Milan’s name has for many centuries been recorded as Mailand, which is still the German name of the city today. It comes from the Celtic Mid-lan (meaning “in the middle of the plain”) and was known as “Mediolanum” by the Romans. An Italian proverb compares the cities of Milan and Rome and roughly translates, “Rome is a voluptuous woman whose gifts are very apparent, while Milan is the shy, demure girl whose treasures are plentiful, but discovered in time.” We all know that Milan is the fashion capital of the world, but did you also know these 10 things? The Duomo di Milano, one of the most famous buildings in Europe, is a large and elaborate Gothic Cathedral on the main square in the center of Milan. It is the second largest Roman Catholic cathedral after the cathedral of Seville. Note: Saint Peter’s Basilica in Rome is not a cathedral. 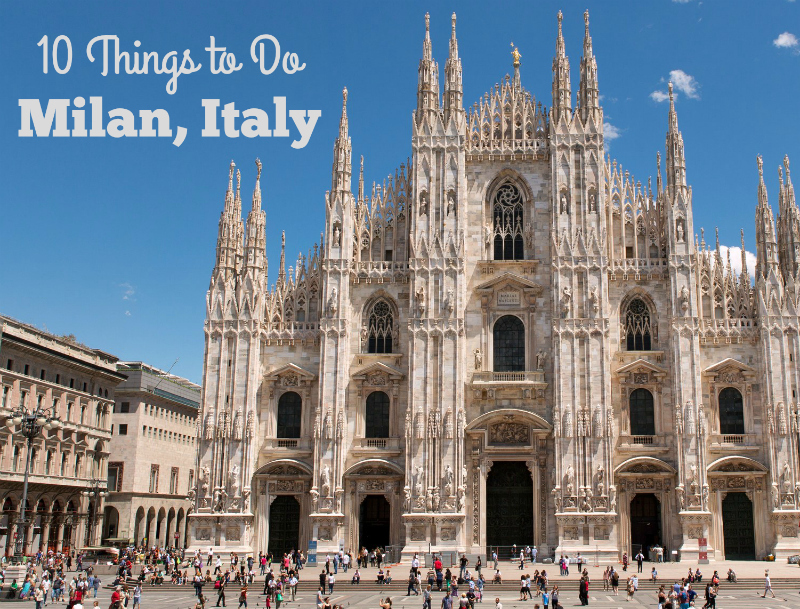 Measuring 157 meters long, the Duomo can host 40,000 people comfortably. The main spire is 109 meters high and the great windows of the choir are the largest in the world. Typically Milanese, the discreet, neo-classical façade of Teatro alla Scala, the world’s most famous opera house, featuring acres of red velvet and gilded balconies. You can tour through this opera house museum during non-performance times. Don’t expect to the strong, bitter, pungent taste of Italian espresso in Milan. Milanese tend to drink their coffee quite long, with added water. This is no doubt to help them linger over the amazing array of pastries and cakes that the city has to offer. We highly recommend stopping by Pavé (Via Felice Casati 27), where you get the both of both world – delicious coffee and homemade sweet treats. 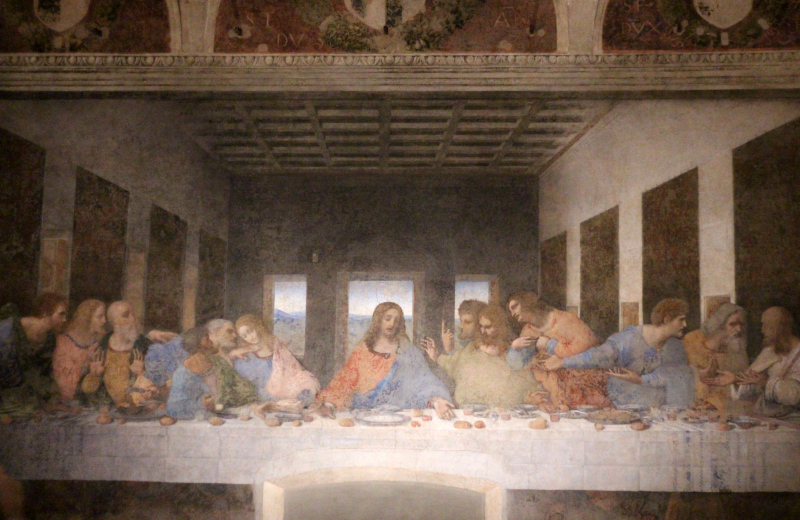 In the church of Santa Maria delle Grazie, you can see one of the most famous paintings of Leonardo da Vinci, The Last Supper. Tickets must be reserved months in advance, so as soon as you book your plane or train tickets, you better purchase these. You have 15 minutes to examine the expressions of consternation, hostility and despair on the faces of the disciples, just as Jesus reveals his imminent betrayal. Because of Leonardo’s experimental technique, the fresco has faded through the years – but that doesn’t detract one iota from the experience of seeing it in the “flesh.” The room is humidity-controlled and non-flash photography is allowed. 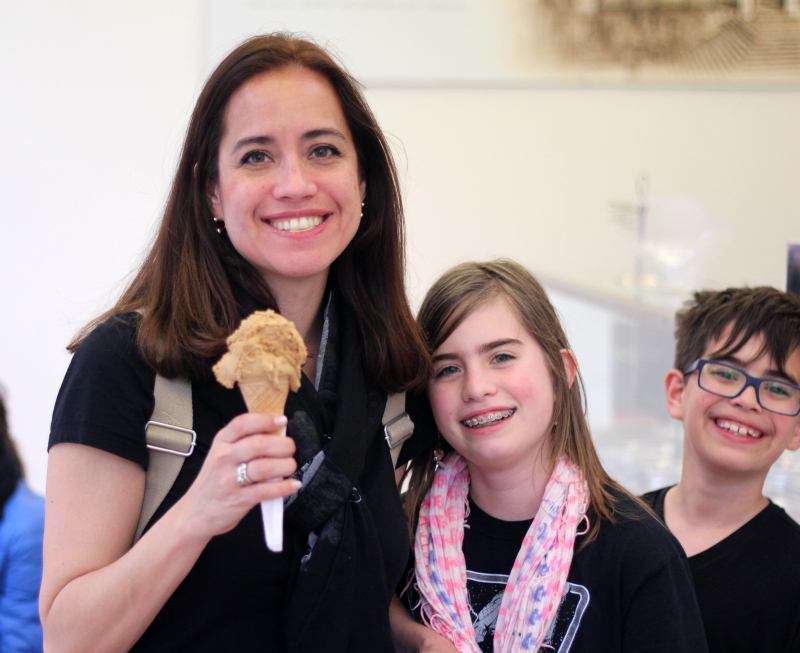 Milan is full of gelaterias, serving flavorful, fresh gelato made from natural ingredients. 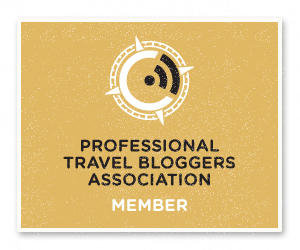 Here’s the scoop on the ones we recommend. 😉 Grom uses only organic, fresh ingredients from around Italy: Sfusato lemon from Amalfi, and the Leonforte peach, for example. They have a central farm where all the raw ingredients are mixed, ensuring their high standards are met. Close by the main train station, Duomo Gelatieri is always fresh and made daily in the ice cream parlor with natural ingredients, no chemical ingredients and preservatives. Plus, they have a €1 cone available for children. You cannot beat that price, especially on a warm Italian day. Built in 2011, its illuminated spire evokes the Duomo, whilst stretching its height those extra few inches, making it Milan’s tallest building at 231 meters. This is the highest Italian skyscraper. The on the basement and ground floor, you will find restaurants, a bookstore and clothing stores. 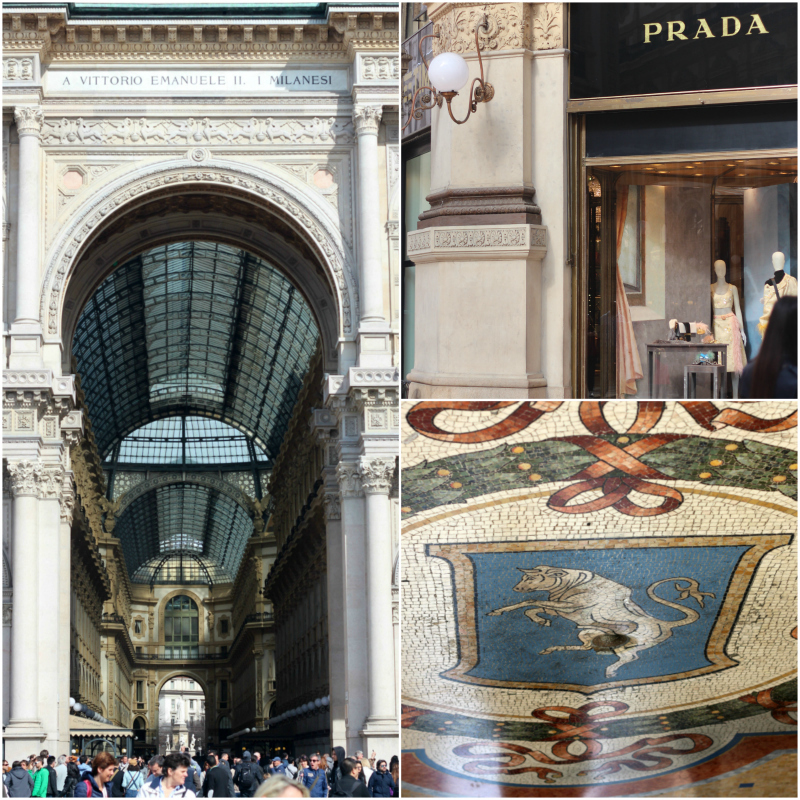 With its glass-and-iron dome, magnificent mosaics and marble floors, the Galleria Vittorio Emanuele is definitely one of the world’s most glamorous and oldest (built in 1867) shopping malls. The first Prada store opened here in 1913. Note: You may see visitors come to spin their heels in the famous bull’s testicles, part of a floor mosaic said to bring good luck. Try the legendary panzerotti – a fried pastry triangle stuffed with tomato and oozing mozzarella – originally from Puglia, but definitely one of Milan’s most recognizable treats. The Sforzo Castle is the picture of the renaissance, with its rounded turrets, spacious courtyards and secret passageways. It also happens to be home to one of the city’s most precious, yet often overlooked, artworks: Michelangelo’s final, uncompleted sculpture, the Pietà Rondanini. We highly recommend picnicking on its lawn with an Italian sandwich during a beautiful, sunny day. The saffron-laced risotto alla Milanese originated in the city and is rooted in its culture. Legend has it that on September 8, 1574, the daughter of Valerio di Fiandra, a craftsman making the stained-glass windows of the Duomo, was getting married. One of the apprentices, who used saffron to color the glass, came up with the idea of taking the white risotto that was to be served at the wedding banquet and turning it gold like his windows by adding the spice. The taste and golden color of the new dish was a hit with the guests and the addition of saffron to rice was widely adopted.